I’ve also criticized his policies on entitlements, trade, child care, capital gains taxation, government spending, and infrastructure. But one good thing about being libertarian is that I feel no pressure to spin. I will criticize politicians who I normally like and praise politicians I normally dislike. So I’ve also applauded some of Trump’s policies, whether they are big reforms like a cut in the corporate income tax or small changes like killing Obama’s Operation Chokepoint. Today, I’m going to give Trump some credit for what’s happening with regulation and red tape. Wayne Crews of the Competitive Enterprise Institute measures the change. The calendar year concluded with 61,950 pages in the Federal Register… This is the lowest count since 1993’s 61,166 pages. …A year ago, Obama set the all-time Federal Register page record with 95,894 pages. 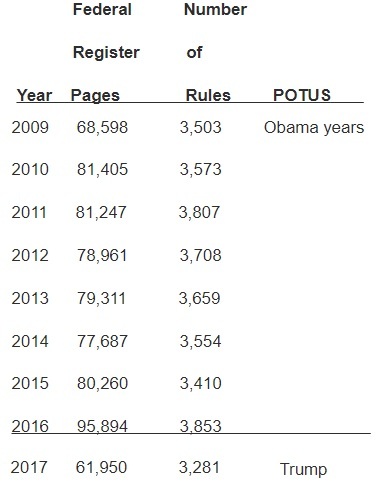 Trump’s Federal Register is a 35 percent drop from Obama’s record… After the National Archives processes all the blank pages and skips in the 2017 Federal Register, Trump’s final count will ultimately be even lower. Here’s a visual that captures what has happened. Wayne explains that the numbers of rules have dropped in addition to the number of pages. …the Federal Register may be a poor guide for regulation… The “problem” of assessing magnitude is even worse this year, because many of Trump’s “rules” are rules written to get rid of rules. …There has also been a major reduction in the number of rules and regulations under Trump. Today the Federal Register closed out with 3,281 final rules within its pages. This is the lowest count since records began being kept in the mid-1970s. Susan Dudley of George Washington University looked at what’s happening to regulation for Forbes. …what has the administration achieved on the regulatory front in 2017? …President Trump issued Executive Order 13771 directing federal agencies to remove two regulations for every new one they issued, and to cap the total cost of new regulations at zero. …An Office of Management and Budget report…finds that during the first eight months of the administration (through September 30th), executive agencies issued 67 deregulatory actions and only 3 significant regulatory actions. …More meaningful is the report’s estimate that these actions will save Americans more than $570 million per year on net. …This was the year of the Congressional Review Act. Working with the Republican Congress, President Trump has disapproved 15 regulations, most issued at the end of the Obama administration. She looks specifically at regulations that involve a lot of money. The pace of new regulation has visibly slowed in the Trump administration. A search of OMB’s database reveals that, between January 21 and December 20, 2017, the Office of Information and Regulatory Affairs concluded review of 21 “economically significant” regulations—those with impacts (costs or benefits) expected to be $100 million or more in a year. 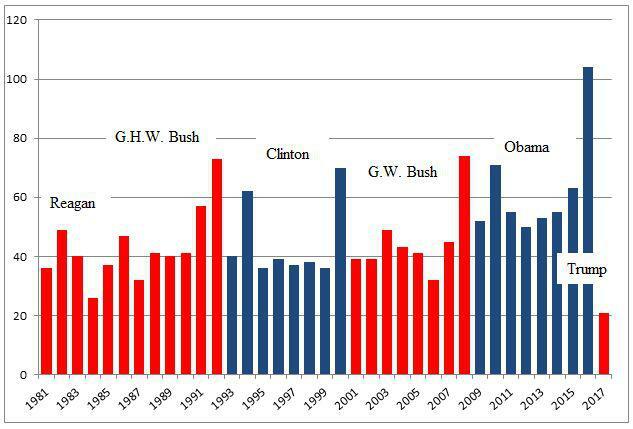 As the chart below shows, that is dramatically fewer rules than previous presidents have issued in their first years. Here’s an impressive chart from her column. And here’s most impressive part. Some of these “significant” rules are actually designed to reduce red tape. …a further breakdown of those 21 economically significant actions this year: …Three are classified as “regulatory,” including two from HHS and one from the IRS. …Four are “deregulatory,” including three HHS rules as well as the congressionally-disapproved FAR rule mentioned earlier. So what does this shift in regulation mean? Well, as the New York Times has just reported, less red tape is good for the economy. A wave of optimism has swept over American business leaders, and it is beginning to translate into the sort of investment in new plants, equipment and factory upgrades that bolsters economic growth, spurs job creation — and may finally raise wages significantly. 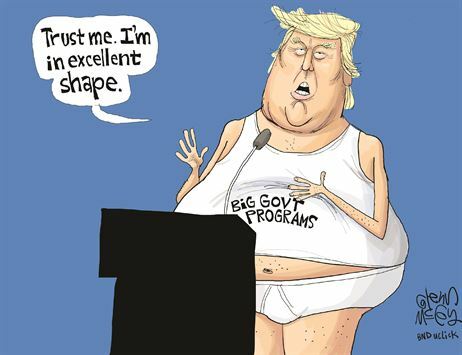 …the newfound confidence was initially inspired by the Trump administration’s regulatory pullback, not so much because deregulation is saving companies money but because the administration has instilled a faith in business executives that new regulations are not coming. I fully agree with this point. What seems to be helping growth is that companies are getting some “breathing room” simply because the regulatory onslaught of the Bush and Obama years has finally abated. …in the administration and across the business community, there is a perception that years of increased environmental, financial and other regulatory oversight by the Obama administration dampened investment and job creation — and that Mr. Trump’s more hands-off approach has unleashed the “animal spirits” of companies that had hoarded cash after the recession of 2008. …with tax cuts coming and a generally improving economic outlook, both domestically and internationally, economists are revising growth forecasts upward for last year and this year. Even before it became clear that Republicans would pass a major tax cut, capital spending had risen significantly, climbing at an annualized rate of 6.2 percent during the first three quarters of last year. Surveys of planned spending also show increases. …business executives are largely convinced that the cost of complying with rules diverts money that could be invested elsewhere. And economists see a plausible connection between Mr. Trump’s determination to prune the federal rule book and the willingness of businesses to crank open their vaults. Measures of business confidence have climbed to record heights during Mr. Trump’s first year. …The Business Roundtable, a corporate lobbying group in Washington, reported last month that “regulatory costs” were no longer the top concern of American executives, for the first time in six years. …The National Association of Manufacturers’ fourth-quarter member survey found that fewer than half of manufacturers cited an “unfavorable business climate” — including regulations and taxes — as a challenge to their business, down from nearly three-quarters a year ago. The bottom line is that Trump has out-performed my expectations on this issue. But I don’t care about that. I’m more interested in a freer and more prosperous America. So when you’re contemplating the shift in regulatory policy, here are a few factoids. Red tape accounts for 20 percent of a nation’s grade according to Economic Freedom of the World. If the current deregulatory momentum is sustained, the United States will rise in the rankings and Americans will be richer. Assuming that is true, raising the long term growth trendline from 2 to 4.5% will guarantee that Americ a remains at the world’s prosperity leading edge. Conversely, staying at a 2% growth trendline will guarantee that America sinks to middle income country ranking by mid century. That 8.8 billion man-hours translates to 4.4 million people working full time or 3% of our workforce filling out government forms. Of that, 7 billion man-hours relates to filing out tax forms. A UBI plus flat tax would eliminate at least half of those hours.